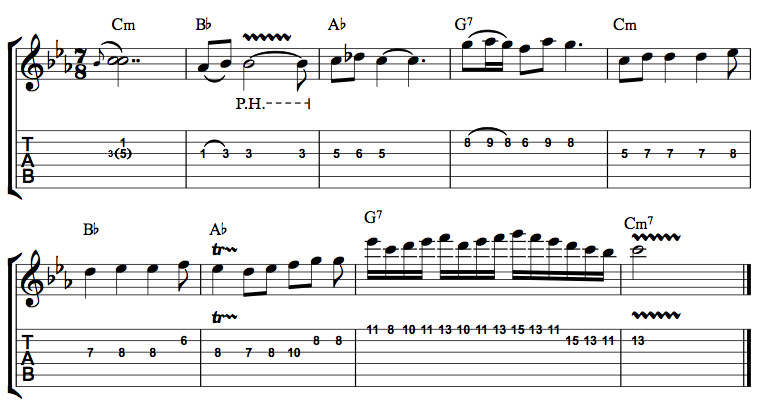 Welcome to this lesson on the use of odd time signatures on guitar. We are going to examine four examples in the styles of different musicians who make great use of odd meter. The end goal here is to be as comfortable playing in other meters as you are already in 4/4. Much of the process of internalization can be done by clapping, singing, counting or (in strict privacy!) dancing in the given meter. This makes them ideal to practice when you’re away from the instrument. To be able to get to grips with many of these meters, a fundamental step is understanding that bars can be divided into a mixture of longer and shorter pulses. The first example is a simple chord arpeggio accompaniment in 5/4. Listen to the drum part and notice how the bar is divided. The snare falls on beats 2 and 5 and the bass drum leads into beats 1 and 4. Outlining the pulse like this means it could also be written as a 3/4 bar followed by a 2/4 bar. Radiohead and Sting are expert at subtly using odd meters and layering melodies over the top that fit so naturally that one hardly notices the meter at all. Example two is in 7/4. The bar is divided into 4 beats and 3 beats. Again, being aware of the drum part will help to feel these divisions. Heavy palm muting and a thick, fuzzy distortion will give the right grunge sound. Listen to Soundgarden for more ideas like this. Example three is another rock/metal riff based in Em. This is slightly more intricate than ex. 2 and introduces a meter with a half beat instead of just an uncommon number of whole beats. Instead of the traditional 9/8 which is phrased in 3 beats, here the meter can be better described as having 4 and a ½ beats. 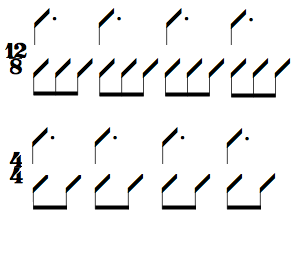 Notice how the drums maintain a standard 4/4 rock beat but then add an extra quaver on the end to form the 9/8. This has the effect of making the fourth beat longer than the other three and the feel of ‘dragging’ into the next bar. Various bands have employed ideas like these including Tool, Karnivool and The Ocean. The final example makes a departure from riffs and accompaniment patterns and induces melodic lead guitar ideas. A great test of how comfortable you are with a given time signature is how easily you can create melodies over it. The more notes there are in the bar the less counting/feeling of the pulse is required. As melodic ideas usually have a lot more empty space in them than riffs, you will have to be even more aware of the pulse of the meter. This is in 7/8, which is best visualised as a 4/4 bar with a quaver missing, making it 3.5 beats long. Instead of counting to seven, it is best to count 1 & 2 & 3 & 4, 1 & 2 & 3 & 4 etc. In the first four bars the ride cymbal is playing disco-esque upbeats, switching to the china cymbal in bars 5-8 which should help to outline the beats of the bar clearly. In the second lesson we will delve deeper into more complex time signatures, as well as looking at the layering of different meters to create cross rhythms. For now, try to check out as many of the bands from the recommended listening as possible, and identify any odd time signatures by counting along. 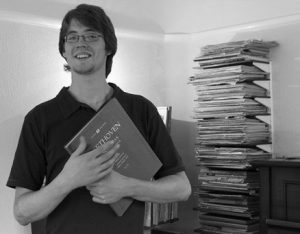 You may also like to try improvising or composing melodies over the top of examples 1 to 3.
from his mum’s choral and piano work to his dad’s folk and world music leanings. unusual string instrument, the ‘Chapman Stick’ at the end of college. Check out www.robthorpemusic.co.uk for more information!